"For those who are diet-conscious or those who are searching for a taste bud pleaser, this soup will be a definite favorite! Served either cool or warmed up, this dish is simple and quick to make while still supplying all the benefits of raw food. Fabulous when topped with a mint leaf or a slice of lime. Enjoy!" Blend cucumber, zucchini, avocado, and garlic in a food processor or blender until very finely chopped, about 30 seconds. Whisk together water, lemon juice, olive oil, and salt in a bowl. Turn on the food processor and pour water mixture slowly through food processor's feed tube while processing cucumber mixture. Process until smooth, about 1 minute. 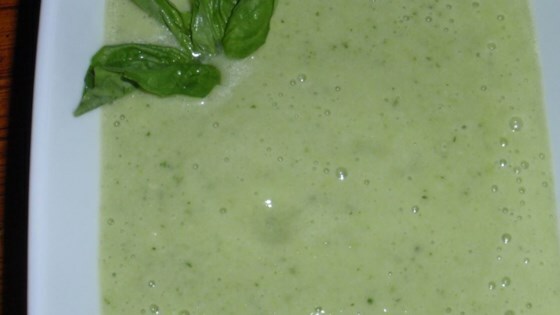 Make this sour-cream and yogurt cucumber soup with an immersion blender. More water can be added to this recipe depending on how you like your soup. Some prefer it creamier while others would rather enjoy a thinner soup. Great tasting smooth soup! I just put all the ingredients in my blender at the same time to process this! I'll be making this again! I LOVE cucumbers, so was very excited to try this. Although it was refreshing, it was also pretty bland. I will prbly make it again, but might just tweek the recipe. This recipe was absolutely delicious! I made it exactly as shown in the recipe, and it came out creamy,refreshing, and wonderful. Thank you! Excellent soup! I was a little skeptical since cucumbers are fairly flavorless, but this was a hit with me, my husband and my parents. It has a great subtle flavor and is very refreshing. I saw a lot of complaints about it being bland. Are people too scared to add their own seasoning? I had to adjust the seasoning a bit but ended up with a tasty soup! Great! Substituting vegetable broth for water gives a flavor boost. This was great. I didn't have avocado so I substituted green peas - it was tasty although avocado would have been better. I also reduced the oil to 2 teaspoons. I will make this again.